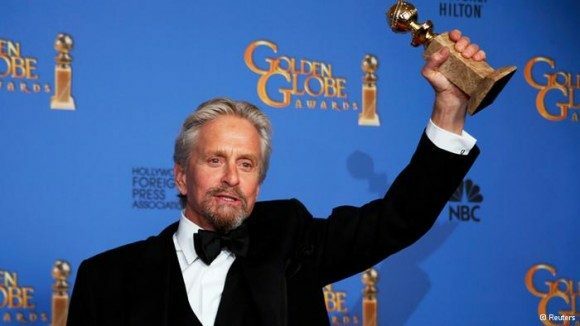 Fresh off a Golden Globe win for his work as Liberace in Steven Soderbergh’s Behind the Candelabra, actor Michael Douglas has been cast in Marvel’s Ant-Man as scientist Hank Pym, creator of the technology that enables the title character’s super powers. The news has several implications (see below) on both Ant-Man and Avengers: Age of Ultron. The Wrap is saying that Michael Pena (End of Watch) is also in early negotiations to join the production. As of this writing, Marvel has denied Pena’s involvement, although on a merely surface level it jives with reports that they’ve been looking for someone to fill a physically demanding part for a “tough Latino.” Douglas, as mentioned, will be shouldering the role of tortured scientist Hank Pym, one of two men who at one time or another have taken on the mantle of Ant-Man in the source material. We’d been among the many who had assumed Paul Rudd, who’s already on in the lead role, would be playing Pym, but it now appears he’ll be playing Ant-Man #2 (chronologically speaking), Scott Lang. Lang is a former thief and electronics expert who (potentially some spoilers) initially steals the Ant-Man suit from Pym in an effort to save his dying daughter, but is later given custody of the technology by Pym provided it’s used well. In the comics, Lang has some connection to Tony Stark and the Avengers prior to his becoming Ant-Man, designing the security for an Avengers base, so it’s conceivable that Rudd might still make a cameo appearance in Age of Ultron. As a creator of Ultron itself (at least in the comics), Douglas seems almost certain to show up on both movies as well. There remains some possibility that Rudd will embody Eric O’Grady, the third And-Man and an antihero, but the short publication history of that iteration of the character bodes against it. Pena’s potential role, meanwhile, is shrouded in far more mystery. More accurately, there is zero information about exactly who he would be playing, and given the tenuous nature of the rumors connecting Pena to the project in the first place, we’ll refrain from any further speculation on his role at this juncture. Ant-Man is scheduled to begin production in April, and will be released July 31, 2015, just two weeks after Batman vs. Superman.